Great Middle-Eastern recipes, beautiful pictures, interesting descriptions, nice paper. The recipes are easy to follow and none of the ingredients are too esoteric to actually make at home. Even though I eschew meat and dairy there are still at least 20 recipes I will make from this book, including the fried tomatoes. A beautiful cook book loaded with Middle Eastern recipes. I've made a couple of recipes so far (butternut squash and red lentil stew & kofta and sweet pea stew. )and they were a big hit. Must admit I bought this attractively laid out and illustrated recipe book as a makeweight to get free postage on the stuff I really wanted, but serendipity rules, and I've made good use of the solid "traditional" Palestinian cuisine ideas contained within. Excellent for lamb dishes and the bitter sweet savouries that are so characteristic of the Middle East, and good news, nearly all the ingredients are now routinely stocked by the major supermarkets. Word of warning, Ms Bishara is a long-time resident of the US and I find the portions a bit on the gargantuan size, so reductions in the quantities listed often needed. As an Ottolenghi/Ghayour fan, this collection could be criticised as unadventurous, but the simplicity pays dividends for lovely dishes like the spiced lamb shanks and the vermicelli and rice pilaf. Restaurant cookbooks like this tend to have more complicated recipes than I want (or they serve 10). I'd be happy to go to her restaurant and let her and her staff cook these dishes for me, but they're just not going to happen often in my kitchen.I did make the seafood soup, which was delicious after I got through all the preparation steps. What a beautiful book! It's one of those cookbooks, like "The Joy of Cooking", that is not only truly educational but also a real pleasure to read. And, much more than "The Joy of Cooking", it's a pleasure to look at. Everything about it- family anecdotes, photos, recipes, binding and layout-contributes to a book that draws the eye and warms the heart. It's a wonderful introduction to a rich and (in the U.S.) little-known culture.As to the recipes, which, after all, are the main point of a cookbook, they are clear and easy to follow. Some, like the pounded ground lamb, I would never make, since I'm semi-vegetarian. Others, like the elaborate Easter and Christmas cookies and the cheese pie, I might try when I have time and energy. Still others are likely to become family favorites. For example, I made the squash and lentil stew last week. It was a hit, and I'm going to be making it again. I certainly intend to try the lentil-noodle soup, also. I also want to visit Ms. Bishara's restaurant! PROS: The recipes are hearty Middle Eastern recipes. The flavors are delicious in the dishes I made. There’s many pictures in the book and interesting stories.CONS: I did not have luck with all the recipes. The pictures would have looked nicer if they had been glossy. The recipes take a lot of prep time and are time consuming.Overall: I wasn't successful with all the recipes I made from this book. The dishes that did work though tasted great. 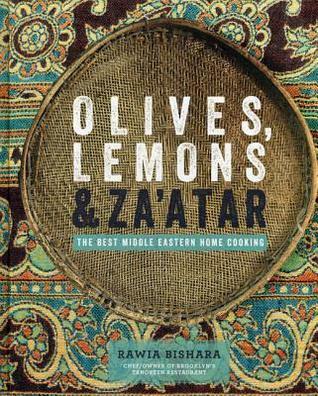 The book is filled with recipes that Bishara grew up with and has in some cases elevated to restaurant quality food. I liked the book, but I probably would not be including it in my collection.You can read my full review and see what recipe didn't work for me here. book from the chef/owner of tanoreen in brooklyn, even though there is a fair amount of meat, there is a lot for a vegetarian to be happy about here, and lots of dairy free and gluten-free stuff as well. i love middle eastern food, and you don't often see a lot of those books with a Palestinian twist (where she's from). i would consider adding this one to my shelf if i found a good deal-- i'd love to have a middle eastern cookbook! i cook with a lot of these flavors and spices already, so it's a good direction. Beautiful, and packed full of lovely recipes that are right up my aspirational cooking alley. I love all the photographs in this, but wish that there were more photos of the actual recipes as well. I always want this, but this is especially so for recipes where the ingredients or dishes are not as familiar. I love this book. I want to own it so badly. Just to flip through it for inspiration. It is lovely. And the recipes are good too. They require more work than the "average" American recipe (with so many shortcuts and time-savers), but it is well worth it for the wonderful result. I didn't find any recipes I wanted to try, but it's a nice cookbook. Beautiful pictures, wonderful narrative. I don't know that I'd make any of the recipes, but it was worth looking at! This is a coffee table cookbook. Beautiful paper and photography, with some nice little stories. I haven't made any of the recipes yet, but have ear-marked many to try. I wish I could eat like this every day. What a wonderful book with beautiful photos and delicious recipes! Nice intro to Palestinian food. What I've made from it has turned out well.